Norichika Aoki is expected to stop the Royals' merry-go-round at the leadoff spot. KANSAS CITY, Mo. — Acquiring Norichika Aoki may not be the final piece to the Royals’ offensive puzzle by any means, but it does solve one lingering problem for manager Ned Yost. Yost now won’t have to carry out any more auditions for the leadoff role. Last year, you’ll recall, Yost flipped back and forth with Alex Gordon in that role, after having tried out just about everyone on the team for the top spot — Alcides Escobar, Jarrod Dyson, David Lough, Lorenzo Cain, Chris Getz and so on. And even when Yost finally was forced to settle back on Gordon in that role, the overall numbers weren’t pretty. The Royals hit just .246 from the leadoff spot with a sickly .309 on-base percentage. All that is likely to change with Aoki. “He’s a guy who gives us a bona fide leadoff guy,” Yost told reporters at the Winter Meetings in Florida. “He’s got tremendous skills, fits our defensive profile, gets on base. 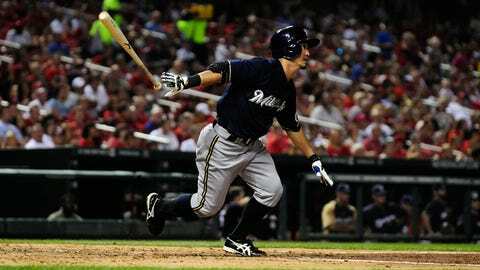 With Aoki, a left-handed hitter, the Royals get a leadoff man who had a .355 on-base percentage in two seasons with the Brewers. Aoki, at least in stat lines, somewhat resembles the last true Royals leadoff hitter, David DeJesus, who has a career .353 on-base percentage. Aoki, though, is more of a threat to steal than DeJesus ever was, despite Aoki’s disappointing 20-of-32 stolen-base line last season. The Royals are hoping Aoki can return to his 2011 form, when he slashed 37 doubles for the Brewers, stole 30 bases and hit 10 home runs. As excited as Yost was to get Aoki, he made it a point not to diminish what Gordon has done in the leadoff role in the past. “We just think Alex best suits us down in the order,” Yost said. Gordon indeed has proved to be a consistent RBI man — he has averaged 80 RBIs over the past three seasons. Meanwhile, who will hit behind Aoki? Most likely Emilio Bonifacio. “We look for Aoki to lead off, Boni to hit second, where he did some solid things there last year,” Yost said at the Winter Meetings. “Then (Eric) Hosmer and Billy (Butler) and then Gordon hitting somewhere in that middle. Just what Aoki’s presence means to the outfield depth chart likely won’t be decided until spring training. With Lorenzo Cain in center, the Royals then will have Justin Maxwell, Lough and Dyson as potential backups. The Royals likely will carry only five outfielders, and none of the backups has any options remaining. “Jarrod is a tremendous weapon with his speed,” Yost said. “We always seem to play close games and he gives us that pinch-running ability late in games. David Lough made tremendous strides last year.